Various ITS projects make Hamburg an exemplary city for urban mobility and logistics solutions. HEAT is the HOCHBAHN-led research and development project for autonomous driving. A 3.9 kilometre-long round course through HafenCity district is being constructed for an electric minibus. A 9 kilometre-long test route will br constructed in the inner city. 37 traffic lights will be modified for the provider-independent and user-inclusive project. Commissioned by the HVV traffic network, HOCHBAHN, S-Bahn, DB Regio, Metronom, VHH and KVG Stade, this pilot project is working towards the realisation of smartphone-based ticketing (including automatic calculation of fares) for HVV. This unique mobility platform provided by Hamburg’s HOCHBAHN AG offers commuters the ability to switch easily from trains to taxis and car- and bike-shares. The range of this programme is expanding constantly. For the pilot project 'Traffic Light Forecast', the State Office for Streets, Bridges and Waters (LSBG) and cooperating partners Swarco Traffic Systems, HERE and Audi have completed a successful test run of high-quality traffic light forecast services. More than 1000 traffic lights throughout the city are to be equipped with these light forecasts. With this project, the State Office for Transport strives to improve traffic control and the management of available parking space through the means of real-time information in parking space utilization. For users, this means time saved and increased comfort, as well as a reduction in traffic related to for parking spaces searches. The State Office for Geoinformation and Survey aims to monitor current infrastructural requirements towards the integration and standardised provision of ITS data. As of July 2018, ioki and VHH are conducting test runs in the districts of Osdorf and Lurup. And as of 2019, MOIA has started its Hamburg-wide pooling service. In cooperation with Workplace Solutions, the State Office for Streets, Bridges and Waters (LSBG) is creating software that enables agile coordination of Hamburg’s 30,000 construction site projects through, for example, a multi touch table. The idea has gained the German Engineering Award for Roads and Traffic in the category Innovation. The goal is to construct a city-wide network of smart lockers. The project is due to commence in 2019. More than 200 participants joined three hackathons dedicated to questions of mobility. Software designers had 24 or 48 hours to develop ideas and apps. The best concepts were awarded by organisers nextReality, HOCHBAHN AG, Deutsche Bahn and Logistik-Initiative Hamburg. Automatic assessment of traffic density is to be realised by 2020 with the help of real-time data generated by infrared cameras installed on traffic lights. Faster and more effective traffic strategies can be developed through this Hamburg Verkehrsanlagen GmbH-led project ― without the sharing of personal data. ITS (Intelligent Transport Systems) means innovative ideas to improve efficiency, safety and comfort of modern mobility. Live in Hamburg: Mobility and Logistics Solutions of the Future. The ITS World Congress 2021 will take place at Messehallen and CCH. 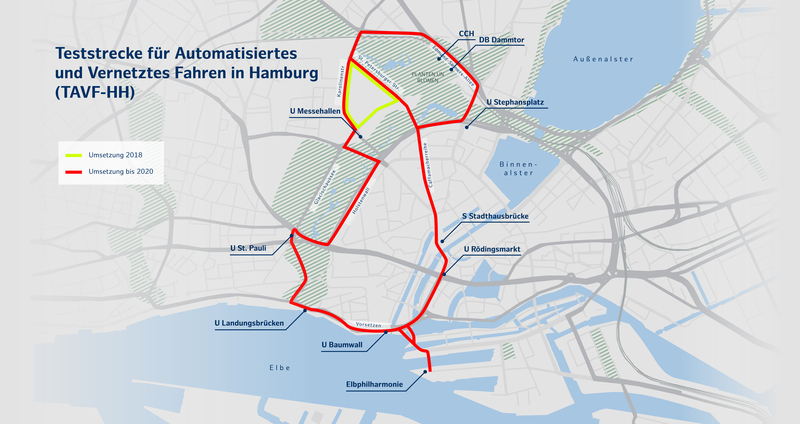 In 2018, Hamburg presented itself at the Congress for Intelligent Transportation Systems in Copenhagen.